Catching one trout on a streamer on the Colorado River and then quitting left me questioning whether I could repeat this success. I constantly see photos on Instagram of large fish with ugly streamers suspended from their jaws. Did I simply need to commit more stream hours to this method of fishing to enjoy more success catching bigger fish? Jane and I hoped to take advantage of another unseasonably warm fall day on Sunday October 26, but when I began checking stream flows and fishing reports, I discovered that the local options were limited. 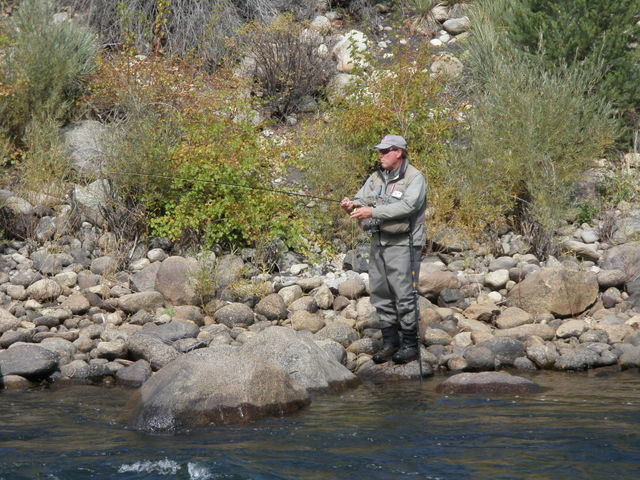 I was hoping to visit a larger river that offered good conditions for streamer fishing, but the South Platte drainage was running low, and the stream reports indicated that the fishing was fairly technical. 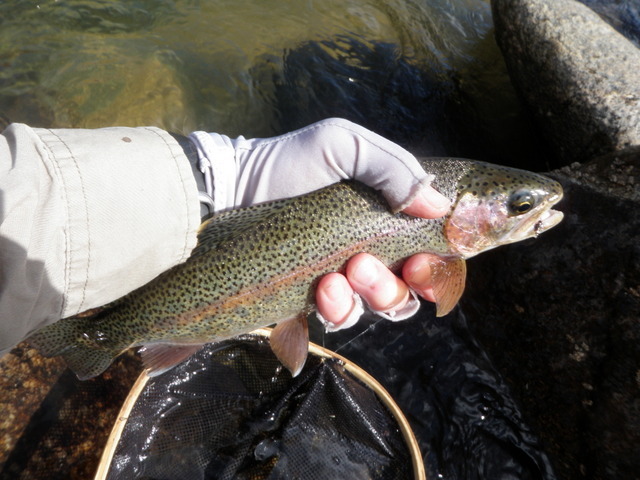 I fished South Boulder Creek on Friday, and I hoped for a different location on Sunday. 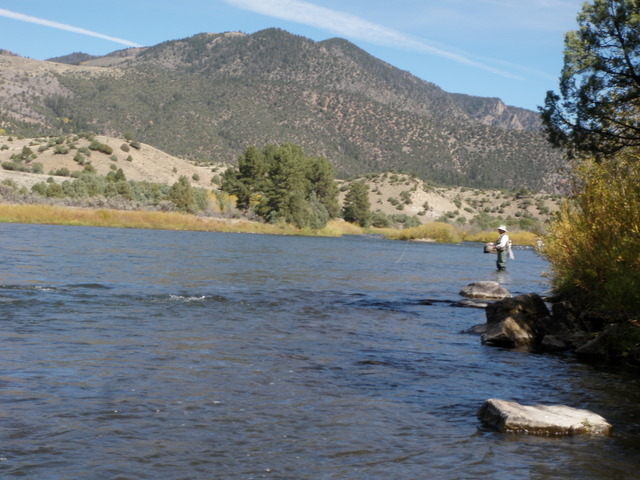 Reports on the Williams Fork and Big Thompson were fair, but both indicated that crowded conditions were the rule particularly on the weekend. The most attractive option was the Arkansas River as it represented a larger river, and that meant streamer fishing was a viable option. In fact the reports from the fly shops in the area suggested that streamers should be in a fly fisherman’s arsenal as the brown trout were becoming territorial. Unfortunately Jane is not a big fan of accompanying me to the Arkansas River as most of the best fishing locations are right next to a busy highway. For this reason I decided to make a solo trip, and Jane stayed at home to enjoy the weather doing local activities. I did not want to pass up a day of mild temperatures particularly since I was scheduled for skin surgery on my back on Thursday October 30. I jumped off to a nice early start and arrived at the Fremont – Chafee county line by 10AM. The temperature was in the low 60’s as I prepared to fish, so I pulled on my raincoat for warmth. The sky was pure blue with no visible clouds, and this condition would remain for the entire day. Because of the larger river and my desire to keep streamer fishing as an option, I elected to use my Scott six weight rod. I dropped my extra spool of sinking line in my backpack so I could make a switch in support of streamer fishing at some point during the day. I did not anticipate surface fishing, so I decided to rig my line with the thingamabobber and level line technique that Taylor Edrington of Royal Gorge Anglers taught me. It is easier to set up this system while at the car, so this delayed the start of my fishing a bit. Finally I was ready, so I crossed the wide river at the tail of the long pool below the county line and then began walking upstream on the north bank. I normally head downstream, but for variety I decided to explore the water upstream from the parking spot. After skipping the bottom third of the pool which consisted of slow moving deep water, I stopped and entered the edge of the river. As my initial offerings I tied on a weighted 20 incher and then below that I knotted on an ultra zug bug. The area where I entered was characterized by a long slow moving slough off to the side of the main current. The side pool was twenty yards long and averaged twenty feet wide, and I began lofting casts directly upstream to cover the entire width from the bank to the current seam. I failed to interest any fish in the first couple series of casts, but then as I dangled my flies behind me while wading upstream three or four steps, I felt a tug. I reacted with a soft hook set and felt the weight of a fish. 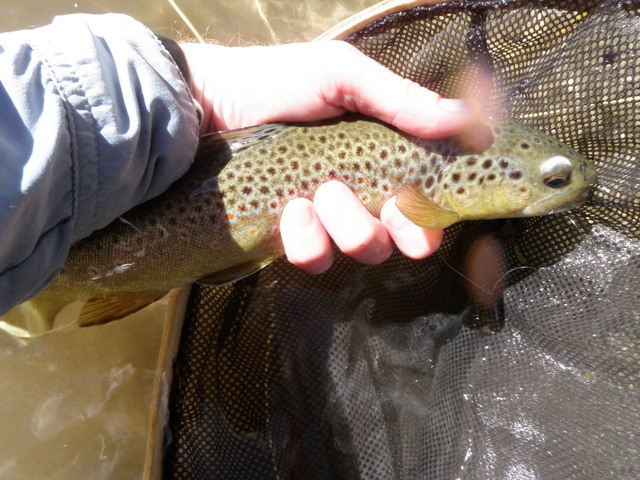 The twelve inch brown put up a spirited battle before I netted it with my new Hobbs Creek net with a rubber bag. I decided to photograph the fish that christened my new net and discovered that the rubber bag material provides a nice contrast for photos. Next I moved halfway up the long side pool and lobbed a cast toward the top and, wham, the indicator dove. Again I reacted with a swift hook set, and a hot fish streaked down the river, but I soon discovered that it was foul hooked by the 20 incher. I release the chunky thirteen inch brown and tossed another cast to the top of the pool and once again the indicator dove. This time a smaller brown leaped above the water, but it became free in an instant after the launch. When I reeled up my line I discovered that the entire five foot section of level monofilament broke away from the thingamabobber. Apparently I tied a bad knot, but I was puzzled by how I was able to land the previous fish, particularly the foul hooked brown that generated quite a bit of tension on my line. Perhaps the foul hooked fish somehow nicked the leader near the knot during the fight to escape. The early fishing was amazingly hot so I quickly moved on and fished the tandem of nymphs in all the likely runs and pockets along the north bank of the river. In total I landed five fish before breaking for lunch at 12:30, and in addition I experienced several long distance releases and the foul hooked fish mentioned earlier. It was a strong two hours of action. Shortly after moving above the long slow moving stretch, I reached another juicy spot. As I lifted my flies to recast at the tail of the riffle of moderate depth, I felt weight and accelerated my lift into a hook set. This action caused the weight to charge upstream for safety and a solid battle ensued. Eventually I slid my new net beneath a hefty fifteen inch brown trout, and this proved to be my best fish of the day. The afternoon pretty much followed the morning in terms of fishing method, but the pace of fish catching slowed quite a bit. The fish averaged twelve inches in length, and all were brown trout. The negative factor that affected the afternoon fishing was the strong wind that gusted down the canyon. If I ever had thoughts of fishing with a dry/dropper, the wind reminded me that it was a bad idea. Even with my stiff six weight I had great difficulty punching casts upstream despite the benefit of the extra weight provided by the strike indicator and split shot. In many cases the wind still managed to push the flies back toward me, and this probably affected my catch rate more than I realized particularly in places that lacked depth. In order to generate the line speed necessary to penetrate the wind I overpowered the forward stroke and accelerated my rod tip down toward the water. This worked to some degree, but it created quite a disturbance where the flies splashed through the surface of the river. As I was wading upstream, I noticed three or four fish that bolted from the bank cover, so I tried to make casts very close the stream side rocks and vegetation particularly where the river offered depth next to cover, and this strategy paid off with several nice fish. By 2:15 I was not catching fish on the 20 incher, so I swapped it for a beadhead hares ear. I remembered the hares ear generating quite a bit of success on previous late October trips to the Arkansas River, but it was not the right fly for 2014 and yielded no fish. As 2:45 arrived my fish count stood at twelve, and all the brown trout fell for the ultra zug bug except for two that favored the 20 incher in the early phase of my outing. The ultra zug bug continues to amaze me with its effectiveness and has become a major weapon in my arsenal. And best of all it is easy to tie! During the mid-afternoon time period I approached the water across from the next wide pullout as one drives west toward Salida. This fifty yard stretch of river appeared to be absolutely delicious with a series of wide riffles and deep runs behind large protruding boulders and flowing over rocky bottoms of moderate depth. Much to my surprise however it did not produce as I anticipated, and I landed two of the twelve in this area. During previous visits to this area it produced fish after fish, and despite low productivity on Sunday, I pledged to revisit it when I return in the spring if the flows allow me to cross. At 3PM I sat down on a rock and removed my spool of floating line and replaced it with a sinking tip. I added a couple of sculpzillas to my fleece pouch at the outset of the day, so I removed an olive one and tied it to my line. I began working upstream making mostly short casts across to the current seam and then allowing the undulating olive marabou glob to swing back across toward my position. I twitched and stripped the line constantly as I worked the fly across and below me. I also experimented with upstream casts to deep pools, and during these drifts I jigged the streamer up and down as it tumbled back toward me. Despite my creative movements, the fish were having none of it until I reached a fairly shallow nondescript stretch of water. I’m not even sure why I did it, but I flicked a backhand cast fifteen feet above where I was standing so that the ugly sculpin landed six inches out from the bank.I was shocked to see a twelve inch brown trout materialize from two feet of water, and it instantly chowed down on the olive marabou mass. I could not believe my eyes, but I set the hook and played the feisty fish to my new net. I snapped a head shot as proof that I caught another fish on a streamer and then released it to the cold clear river. Similar to my experience on the Colorado River, my streamer success did not last long. On the third cast after releasing the fish, the sculpzilla became wedged on something in front of a large rock. The water at this point was fairly deep and fast, but I managed to wade close and discovered a large jumble of sticks anchored in front of the rock. I attempted to use my wading boot to break up the stick jam and free the fly, but somehow in this process I broke off the sculpzilla. By now it was 3:45 and the shadows were extending over 75% of the river, and the fishing was slow so I decided to begin the long hike back to the crossing at the tail of the long pool. It was a decent day for late October with thirteen fish landed. I broke in my new net, reintroduced myself to the thingamabobber/level line nymphing technique, and managed to land another fish on a streamer. Not bad. Location: The first point after tunnel 1 where the stream crosses to the north side of the highway when driving west through Clear Creek canyon. The original plan for the last weekend in October was to hike and fish with Jane on Friday, work on chores around the house on Saturday, and then hike and fish again on Sunday. Fortunately, the major task of repairing a broken shelf in the garage did not take as long as anticipated, and the high temperature in Denver was once again expected to be in the low 80’s, so I made a last minute decision to visit Clear Creek. I could not forego fishing on such a beautiful day in late October. Normally a trip to Clear Creek is a blatant number boosting gambit, but on my last visit during the summer I discovered the small fish in Clear Creek canyon were quite selective thus requiring more focus than I normally associate with this small stream. I was apprehensive that the same situation would evolve on Saturday, particularly given the late October date and the scarcity of aquatic insects. As usual most of the pullouts were occupied with numerous cars as I slowly cruised west on route six looking for the ideal spot to wet a line in the early afternoon. The canyon is narrow at most places, so I was mainly looking for a stretch of water that would be in sunlight for a few hours. Finally a few miles after passing through tunnel number one I reached a place where the creek crossed beneath the highway and ran for a half mile along the north side of the road, and this stretch was bathed in sunlight. I executed a U-turn and parked in a pullout that already contained two cars. I assumed that the fishermen from these cars were in the water directly across from the pullout, and I planned to walk east on the shoulder and then fish back upstream to the car. When I was ready with my Loomis five weight, I followed my plan and walked along the narrow shoulder to a point where I could descend the steep rocky bank without excessive risk of injury. When I reached the edge of the water, I decided to begin with a dark olive size 16 deer hair caddis since this fly performed well on Friday afternoon. The canyon walls at my starting point were fairly steep on both sides, and this topography forced the water through a fairly narrow channel. Despite the high velocity in the middle of the stream, quite a few nice pockets presented themselves for me to prospect. I began popping quick casts into these areas. This type of fishing yielded short drifts, but I landed two small brown trout in a short amount of time. I continued the strategy of making a few quick casts in all the likely spots as I moved at a fairly rapid pace upstream. During the first half hour I managed two more browns in addition to the two in the initial set of pockets, but then I noticed two or three fish in succession that rose up to inspect the caddis but then settled back near the bottom. The caddis was also requiring more frequent trips to my dry shake canister in addition to developing a rejection complex, so I elected to replace it with a size 12 stimulator with a gray body. The large bushy dry fly could support a beadhead dropper, so I added a short 18 inch section of tippet and tied on a salvation nymph. With the change of flies I decided to cover the water that yielded refusals from two fish, and each fish stopped the stimulator in its tracks by gobbling the trailing salvation nymph. It was pretty clear that the brown trout in Clear Creek preferred a salvation nymph over an olive caddis. These flies remained on my line for most of the afternoon, and I added six more fish that inhaled the salvation. Several of these fish proved to be the best fish of the day in terms of size, as they stretched the tape measure to ten inches. By 2:45 the shadows covered most of the stream, and the stimulator with the white wing was sinking more frequently. I was curious to know if adding a second nymph to get my flies deeper would attract more attention, but I required a larger top fly to support the added weight of two beadhead nymphs, so I tied a gray pool toy to my line as the surface fly and then added an ultra zug bug below the salvation nymph. I fished these flies through some water covered in shadows and managed to add a brown that smacked the pool toy to the fish count . I was approaching an area where sunlight remained on the water as the canyon opened up a bit, but when I looked up three fishermen came into view. Since my path was blocked by this trio, I circled around them and reentered the stream and fished some attractive water with no positive results. Just as I was about to merge back into the shadows another fisherman appeared, so I decided to quit and scaled the high rocky bank to the highway. It was admittedly a numbers padding outing as I landed thirteen small brown trout in two hours of fishing. The fish were quite small with the largest measuring ten inches, but it was still an enjoyable afternoon in gorgeous weather in late October. The meteorologists forecast unseasonably warm weather for Denver, Colorado for Friday October 24 through Sunday October 26, so Jane and I made plans for an outdoor day on Friday. I hiked the Walker Ranch Loop in July 2013 with my friend Don Batchelor, but Jane had only completed pieces of this trail. I had the ulterior motive of wanting to scout the point where the trail intersects with South Boulder Creek, so I suggested that we hike out and back on the Crescent Meadows section, and then I would spend the rest of the afternoon fishing in South Boulder Creek. From the Crescent Meadows parking lot to the bridge over South Boulder Creek was 2.3 miles, so we were undertaking a 4.6 mile hike, and we both felt this was about right. Jane and I completed the 4.6 mile hike on Friday morning in approximately two hours. It was great fun as we snaked through a sparse forest of pine trees and junipers before eventually dropping down some steep steps to the edge of South Boulder Creek. From that point we climbed over a short rocky hill and then found ourselves at the bridge that spans the stream. We passed one biker and four female runners, so we essentially had the area to ourselves. When I checked the stream flows on area streams on Thursday, South Boulder Creek below Gross Reservoir was listed at 91 cfs. As I gazed at the stream as it passed under the bridge, I suspected that the current flow was much less. Our return hike was a 900 foot vertical climb over 2.3 miles so we were constantly fighting a gradual grade. We began the day with added layers, but by the time we reached the car, we were clad in just T-shirts. It was 1PM when we reached the parking lot, and then we drove to a second lot just beyond the first bend on the north side of the stream. I pulled on my waders and assembled my Loomis 5 weight rod, and Jane and I then descended the steep path to the small tailwater. Jane wanted to set up her chair to read at the base of the path, so we stopped next to the stream and ate our lunches. After lunch I said goodbye and hiked downstream for twenty minutes to a point just beyond a large jumble of boulders that form the base for the trail and then continue down to the edge of South Boulder Creek. I could not believe the number of exposed boulders in the stream bed, and I was certain that the flows were drastically reduced from the DWR web site reading on Thursday. When I checked the flows on Saturday, I was surprised to see that the water managers dropped the flows on South Boulder Creek from 91 to 17 in one day! What a dramatic change. By 2PM I was finally ready to fish, and I tied on a size 16 olive deer hair caddis. I pulled my fly line out of the tip, and to test the flotation of the fly, I flicked it into a shallow riffle below me and fed out some slack. It was bobbing along nicely when a small brown trout attacked it, and I had my first fish in a matter of minutes. My curiosity was aroused, so I floated the caddis through the riffle a second time but allowed it to dance farther downstream until it was just beyond a protruding boulder, and at this point a second small brown inhaled the small dry fly. 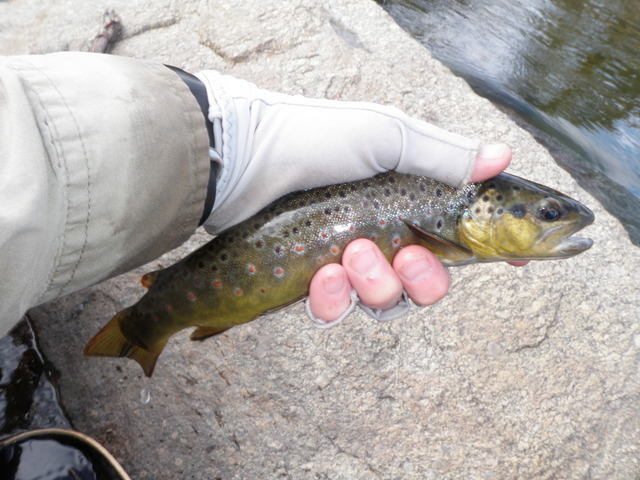 I released this fish and waded toward the center of the stream, and then I dropped a cast into the short pocket behind the exposed boulder, and trout number three smashed the caddis. What a way to start my day! I was now rather euphoric as I began working my way upstream, and it did not take long before I landed a fourth brown trout on the caddis in a run that was only two feet deep. However, as I’ve learned through many years of fly fishing, the only constant is change, and now the confident takes changed into frustrating refusals. Obviously my imitation was close enough to attract the attention of the trout, but it differed in some critical way causing the fish to turn away at the last instant. As this thought was bouncing around in my head, I began to observe quite a few tiny black stoneflies flying erratically above the stream, and simultaneously a few sporadic rises caught my attention. I read my two blog posts from October 21 and 23, 2012 before making the Friday trip, and in these reports I described encountering small size 18 black stoneflies between 2 and 3PM. Being a smart fisherman, I stashed five or six size 18 black stonefly imitations in my fly box in anticipation of this event, and now I replaced the size 16 caddis with one of these. The move was magical, and I landed four trout over the next thrity minutes. The fish were gulping the little fake bug with utter confidence, and one of the fish that I landed during this time period was a colorful rainbow that would become my best catch of the day. After this fast action I continued moving upstream, but the number of visible stoneflies diminished, and the fish began to ignore my previously red hot offering. The small stonefly with a charcoal colored wing was very difficult to follow in the glare and riffles and thus made a poor searching pattern, so I clipped it off and returned to the size 16 olive brown deer hair caddis. The caddis generated some success as I landed four more trout by prospecting likely lies. The pace of catching was slower, so I moved rather quickly from place to place, but there were enough interested fish to keep me focused. At 3:30 I looked up and was startled to discover two fishermen in my path next to a nice deep pool. I quickly concluded that they were a father and son team, so I exited and allowed the father to continue fishing with his son while I circled around and above. I allowed fifty yards of space before I cut back to the stream and resumed my progress. Shortly after reentering the creek I approached a spot where the current flowed between an exposed rock and the bank via a three foot wide gap. Below the gap the current formed a nice long deep run that ran for eight feet and was never wider than five feet. I paused to observe and saw two decent fish in the run. One was just below the rock, and the second fish was five feet farther downstream in front of a smaller underwater boulder. Because of the low clear water I elected to hold my distance and began tossing longer than normal casts to the visible fish. My stealth could not overcome the fact that they ignored my caddis, so I tied on a size 14 light olive stimulator and then dropped a soft hackle emerger off the bend of the dry fly. 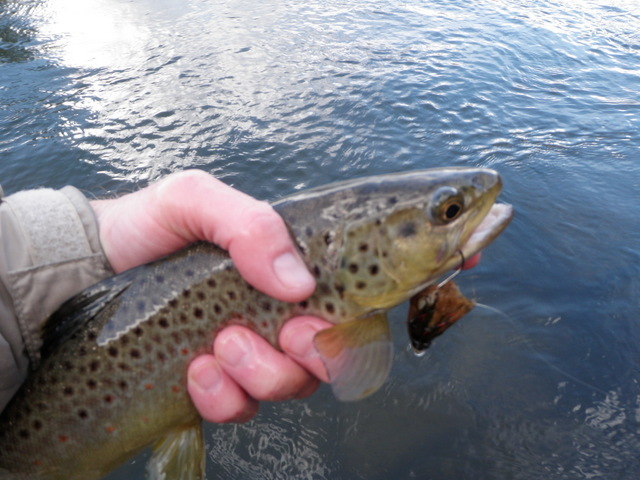 After several casts a brown trout snatched the soft hackle emerger as it went along the bank. This fish was not one of the two I spotted, and those two, which appeared to be rainbows, ignored my offerings so I moved on. My last fish of the day was a brown trout that grabbed the soft hackle emerger as it began to swing away from the bank as I executed a downstream drift on the south side of the creek. By 4PM the shadows covered nearly the entire stream, and the air was beginning to feel cooler. I had quite a distance to hike, and I guessed that Jane was getting anxious to leave. I climbed the bank and made the 15 minute hike along the trail to Jane’s retreat, and I found her folding her chair to head back to the car. My timing was perfect as we gathered everything and climbed the steep path to the parking lot. It was a fun day on South Boulder Creek with a high temperature in the middle 70’s. I had the stream almost entirely to myself, and the abnormally low flows seemed to concentrate the fish in the deep pools, and the fish were still looking toward the surface for food. This translated into dry fly success. Best of all, I did my homework, and it paid dividends as four of the better fish gulped my little black stonefly imitation. Sometimes fishing is not about catching fish. That pretty much summarizes Thursday October 9. The weather forecast for Thursday called for increasing cloudiness with heavy rain beginning by 1PM. Apparently the remnants of hurricane Simon were moving into Colorado from Baja California, and the southern part of the state was expected to receive more rain than the north. Steve and I were returning from Steamboat Springs to Denver, but we planned to fish somewhere along the way. We did not expect to fish all day, so rain in the afternoon would not affect our plans. We departed Steamboat Springs and crossed Rabbit Ears Pass and then headed south over Muddy Pass toward Kremmling, but as we sped down the highway we saw a traffic jam ahead. 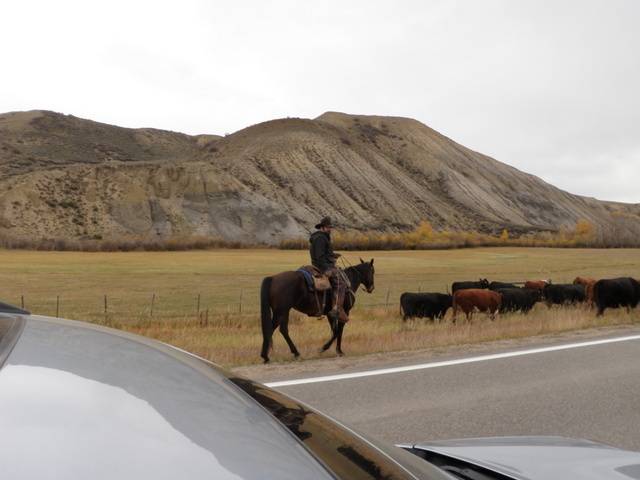 One would normally expect a traffic tie up to involve cars, but on this occasion several vehicles were stopped to allow cattle to cross the highway. We joined them and watched as real cowboys wearing cowboy boots, spurs and chaps herded a group of moving beef across the road. I snapped a few photos, and within five minutes the road was clear, and we resumed our trip. 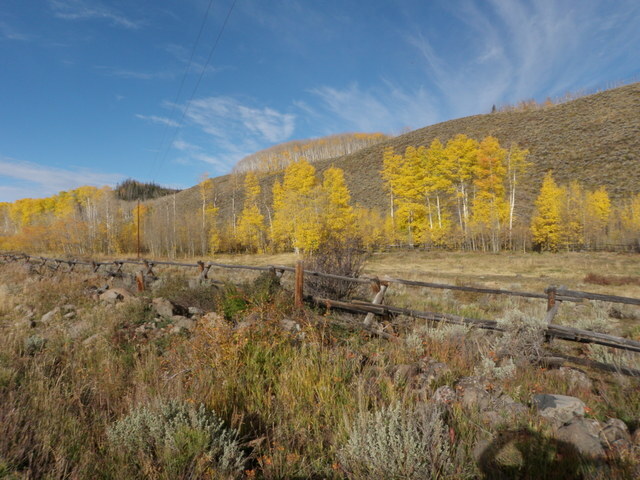 On our way from the Pumphouse Access on the Colorado River to Steamboat Springs on Tuesday, we noticed a dirt road that turned left before we reached route 9, and we were curious where this led so on our return trip to Denver we decided to detour a bit and check it out. Perhaps this would be a fishing destination for Thursday. We turned right as we climbed the hill south of the Colorado River crossing, and then made another right just before reaching the Blue River. We were now driving north along the Blue River, and after a couple miles we reached a parking lot and BLM pay station. We jumped out of the car and stood on a high bank at the edge of the parking lot where we could see the confluence of the Blue and Colorado Rivers. The Blue River was running at 750 cfs, and that is quite high for that tributary. With flows farther west at Pumphouse running at 1250 cfs, the Blue River was contributing more that 50% of the combined river. Both rivers were wide smooth pools just above the confluence, and Steve and I both concluded that this would dictate very challenging wade fishing. The rivers were far better suited for boat anglers who could pound the banks with streamers or hopper/dropper rigs. Since we agreed that other locations were more attractive, we moved on and continued traveling south on route 9. Next we reached a turn that would take us to the dam at Green Mountain Reservoir, and we made another detour to check out this water. Neither Steve nor I had ever fished the tailwater below Green Mountain, but we had read articles about it and were anxious to scout it and possibly make it our destination for Thursday. The road that turned off of route 9 took us across the top of the dam, and then we turned right and slowly drove down a steep hill to a small parking lot. When we jumped out of the car and walked to the trailhead, two young fishermen were preparing to launch their pontoon style raft into the river. There was a thirty yard long steep bank from the parking lot to the river, and they had backed their trailer to the edge of the precipice where they planned to slide the boat downhill while holding it back with a long rope. Rather them than me! We approached the would be boat launchers and asked if there was a path that could be used by wade fishermen. One of the young men replied that there was a trail that angled more gradually down to the river than the boat launch slope. He informed us that there are two miles of public water below the dam, but only .5-1 mile of it was accessible on foot as a huge vertical rock wall eventually blocked farther downstream progress. Steve and I gazed down at the river, and it was rushing through a narrow canyon with steep walls on both sides at 750 cfs. We both felt that this would be fun water to explore in the future when the flows are 500 cfs or less, but we were not interested in fishing it when the current was crashing through the canyon at its current rate. 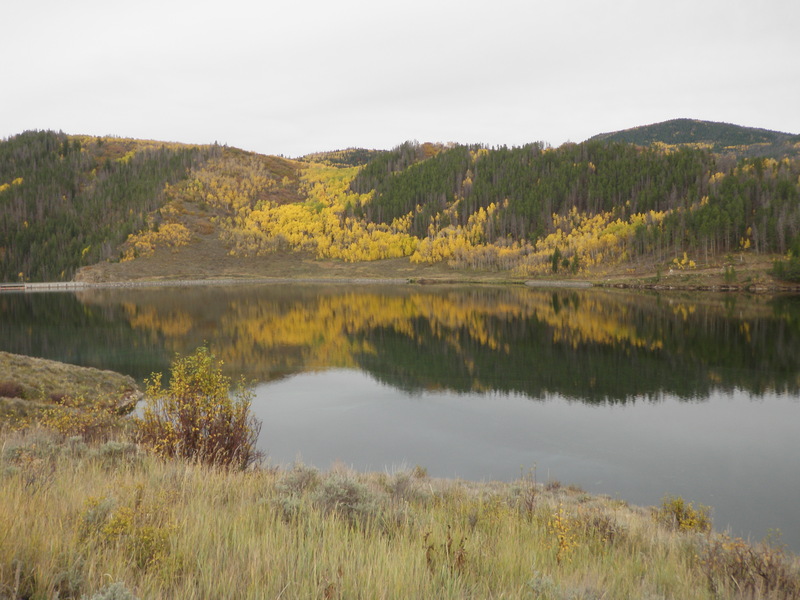 We both jumped back in the car and drove along the western shore of Green Mountain Reservoir and then crossed the Blue River above the inlet and proceeded a short distance to the first public access point above the lake when heading south toward Silverthorne. Here we finally decided to halt our scouting trip and actually fish. The sky was quite gray by this time, and we already experienced periods of drizzle and light precipitation. As mentioned previously, the weather experts were calling for heavy rain at times, so we hoped to register a few hours of fishing before the forecast became reality. When Steve and I were prepared, we hiked down a path that led to the downstream border of the public water. I elected to wade across the Blue River to the west bank, and Steve began fishing with his nymph rig on the east side. 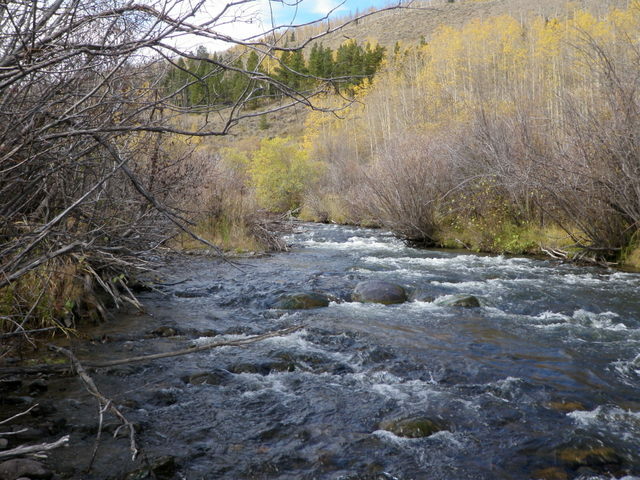 The flows on the river above Green Mountain were nearly ideal at 110 cfs. My first choice of flies was a gray pool toy plus a beadhead hares ear and an ultra zug bug. The water was wide and shallow initially and offered few attractive fish holding spots so I moved upstream rather quickly. After covering a fifty yard stretch of water as described in the previous paragraph, I approached a different section where the river narrowed a bit, and this created deeper pools and pockets. Finally in a relatively nondescript stand-alone pocket behind an exposed boulder, a rainbow rose and slapped the pool toy. I quickly set the hook despite my surprise, and I pricked the fish for a split second. I immediately popped a second cast behind the rock, and a fish once again rose to the hopper. Once again I set the hook, but the rise was either a refusal or I set to quickly, and when I netted the thirteen inch rainbow I discovered it was foul hooked. At least I found evidence of fish, so I moved on and changed the ultra zug bug for a soft hackle emerger in case the overcast conditions provoked a blue winged olive emergence. BWO’s typically become prevalent as the morning moves into afternoon particularly on gray overcast days. The change however did nothing to reverse my fortunes, and I moved upstream and covered a huge amount of very attractive water with nothing to show for my persistence. By 1PM I replaced the soft hackle emerger with a salvation nymph thinking that attractor nymphs may be the answer if a blue winged olive hatch was not on the menu. In a long ten foot slick behind a protruding boulder, I cast across to just behind the rock and then held my rod high to keep the fly line off the water as the flies drifted to the tail. As the flies began to sweep and lift, a fish grabbed one of the imitations for a moment, and I set the hook; but once again the weight of a fish was momentary. I continued up the right braid around a midstream island with no reprieve in my bad fortune, and when I reached the top of the island, I encountered Steve. Steve’s fly was in his hook keep, so I concluded he was ready to call it a day. Given my lack of success, I was in agreement, so we waded back across the river and followed the fence line back to Steve’s car. Once we reached the car, we loaded our gear and departed for Denver before the serious rain developed. Thursday was not about catching fish. Instead scouting locations for future fishing trips was the positive, and that information will be put to good use. Having finally connected with Steve at our parking place along Bear River, we both agreed that we had sampled enough of Bear River to satisfy our collective curiosity, and we were anxious to move on. 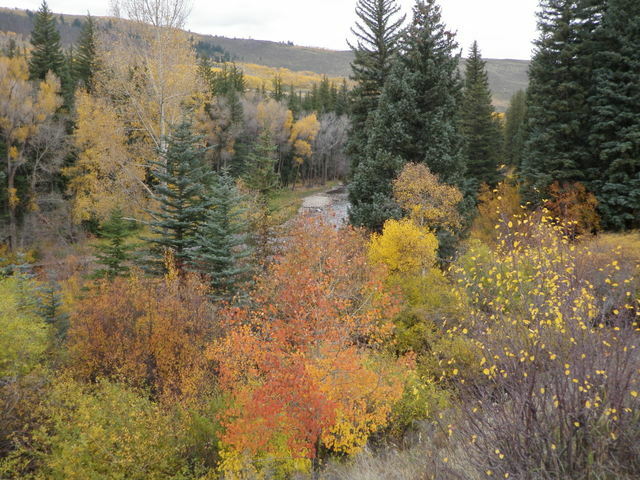 Steve told me on the drive to Steamboat Springs on Tuesday that the tailwater below Stagecoach Reservoir had changed dramatically since the stream improvement work was completed in 2013. He suggested that we stop at that magnificent fishery on our return from Bear River so that I could judge it for myself. Steve commented that the stream improvement work straightened the stream and removed rocks and current breaks. I was led to believe that the opposite is true of stream improvement; rocks and structure are typically added to straight and shallow featureless water. I was very curious to understand what Steve meant by these observations. Only two or three other cars populated the normally crowded lot near the Yampa River tailwater below Stagecoach Reservoir, and the fishermen that were present appeared to be crowding into the upper unimproved stretch of water. Steve and I remained in our waders and our rods remained strung from our Bear River expedition, so we were on the water in a short amount of time. As we negotiated the well worn trail to the lower portion of the public water, Steve realized that he forgot to remove his phone from his shirt pocket, and not wishing to risk water damage, he returned to the car. This allowed me to access the water first, and I began fishing just below the only large bend in the upper catch and release section. The state park and department of wildlife personnel went to great pains to re-vegetate the land bordering the river by hammering unattractive metal posts into the bank and then stretching metal fence wire in between. The fence was so close that it leaned over the stream a foot or two in many places. There were well marked chutes between the fenced areas to allow fishing access. It reminded me of the crowd control mazes that exist at amusement parks and ski lift lines. The portion of the stream where I began was representative of the stream improvement area. It appeared to be a deep trough, and the main current began at the center and then angled to the far bank where the river curved. Once the current deflected against the bank closest to the parking lot, it ran for another thirty feet before tailing out and continuing. The mangled Charlie Boy hopper remained on my line from the end of my fishing time on Bear River, so I decided to stick with it for a bit, and the ultra zug bug dropper continued to dangle below the hopper. The Charlie Boy hopper is an interesting story. I am in a perpetual quest to find the ideal grasshopper imitation. Earlier in my fly fishing career, my preferred hopper imitation was a yellow Letort hopper, and I enjoyed tremendous success with this fly. But as time went by, I grew more and more disillusioned with the dubbed body of the Letort hopper and yearned for an equally effective imitation that was more buoyant. The Letort hopper required frequent trips to my sleeve to sop up the absorbed water and then subsequent dunkings in my dry shake canister. Jane bought me a fly tying book authored by Charlie Craven, and there was a chapter for the Charlie Boy hopper. Several winters ago I tied a batch of tan and yellow Charlie Boys and anxiously awaited the arrival of fishing season to test the effectiveness of this new pattern. The recipe in the book included unknotted rubber legs, but I have noticed that Charlie’s latest directions on his web site incorporate knotted rubber legs. At any rate, the Charlie Boy served the purpose of floating several medium weight nymphs without sinking, and it was very visible in various difficult lighting situations. Unfortunately it rarely produced fish. For this reason I continued searching for alternatives, and on a guided fishing trip with Taylor Edrington, I asked him what his favorite hopper pattern was. Taylor was quick to reply “pool toy”. I greatly value Taylor’s opinions on matters that relate to fishing, so I dutifully returned to my vise the following winter and churned out 10-15 pool toys in colors ranging from yellow to tan. The next summer I began using pool toys as my number one hopper imitation, and the Charlie Boys began gathering dust in my large plastic fly bin. During 2014 I continued using pool toys, but for various reasons including tree branches and broken off fish, my supply dwindled to the point that I was concerned I would have enough for the prime late summer hopper season. On several outings when I needed a large buoyant fly to support several nymphs, I decided to use a tan Charlie Boy since I had a bunch of them, they were visible and buoyant, and I was just using them as in indicator. Guess what happened? Fish started smashing the Charlie Boy! The Charlie Boy was staging a revival that put all of Brett Favre’s comebacks to shame. 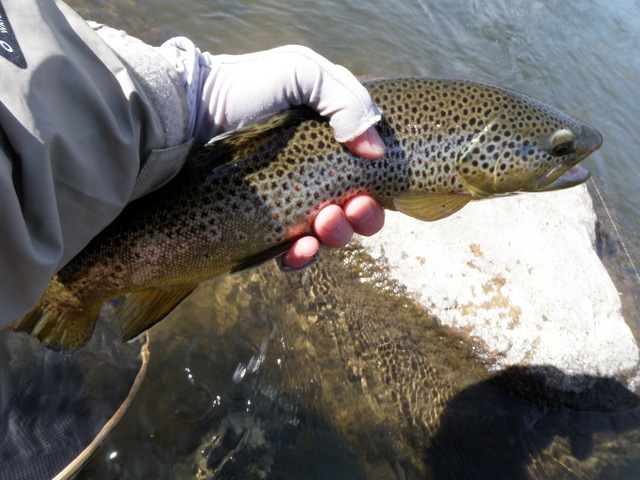 On two trips to the Arkansas River in October the brown trout craved the tan Charlie Boy as I tossed it upstream along the bank. Not only did they favor the Charlie Boy pattern, but I was catching these fish on the same fly. By the time I tied this very same tan Charlie Boy to my line on Bear River, it exhibited numerous holes and tears from the teeth of a long line of ravenous fish. The Bear River usage served to mangle my treasured Charlie Boy even more. Now I was casting my poor workhorse hopper to the inside seam of the main current on the Yampa River. At 3:30 in the afternoon I was certain that it would only be an indicator, and despite its ragged appearance, it still floated reasonably well. Guess what happened? I’m sure with that history lesson on the Charlie Boy, you must have guessed the answer. As the Charlie Boy danced along the inside edge of the current seam and drifted back toward me, a large silvery missile with a crimson flank dashed to the surface and inhaled it. I could not believe my eyes, but somehow I reacted in an appropriate manner and set the hook in the lip of a hungry rainbow trout. 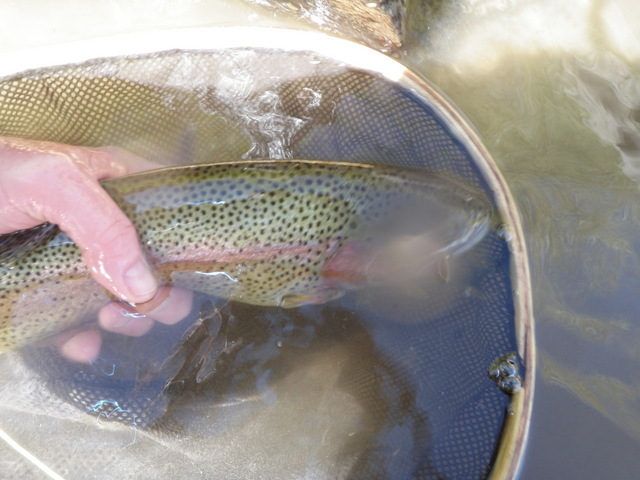 The rainbow streaked up and down the slow moving water next to the faster current several times until I could apply side pressure and slide my cracked net beneath it. 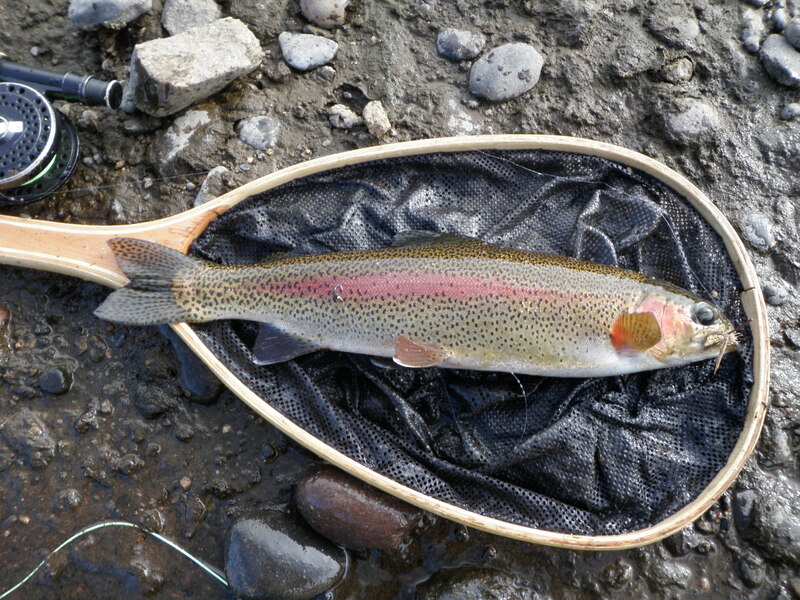 I expected difficult fishing in the late afternoon using tiny midge imitations and in my first section of water, I landed a sixteen inch brightly colored rainbow trout on a large foam hopper imitation. Apparently the fishing gods were rewarding me for my patience on Bear River. I moved on and approached another section where the main current flowed down the center of the river in a deep run. This created slack water on both sides, but the area between the opposite bank and the center current featured an eddy and a small white foam patch. I flicked the Charlie Boy and ultra zug bug along the downstream edge of the eddy, and as the top fly slowly floated upstream next to the foam, it disappeared. I set the hook and felt significant weight, so I responded by battling a second sixteen inch rainbow. This tough fighter sucked in the ultra zug bug, and I was quite surprised to experience this exciting action late in the afternoon when there did not appear to be any significant source of food present. Once again I moved upstream, but now my success rate fell, and I began to make numerous casts without any response. I decided to add a third fly to hopefully attract more attention and spied a gray scud in my fleece patch that I purchased in Viroqua, WI. The Yampa tailwater typically contains quite a bit of aquatic vegetation, and that usually suggests scuds, so I added the gray scud to my lineup. I approached another deep run in the center of the stream and ran my three flies along the seam and witnessed another dip of the Charlie Boy. Could the scud have made the difference already? I managed to land this fish, and it turned out to be a thirteen inch brown that fell for the ultra zug bug. The late afternoon time on the Yampa was proving to be icing on the cake. I continued on, but now I was covering attractive water, and I was not generating any response so I clipped off the gray scud and replaced it with an orange version, but this also was ignored by the residents of the Yampa River. I did observe a fair amount of midge activity in the cool late afternoon air with shadows beginning to lengthen across the river, so I opted to follow the conventional wisdom and tied on a zebra midge as my bottom fly. By now I arrived in a slow deep pool and fish were sipping something sporadically on the surface. I cast the Charlie Boy one third of the distance up the pool, and as it slowly drifted back toward me, it dipped and I set the hook and discovered a small seven inch rainbow had sipped the zebra midge. It was not much of a fish, but at least I now knew that the tiny zebra midge was viewed as a viable source of food on the Yampa River in the late afternoon. A short stretch of faster water separated the slow deep pool from another nice pool closer to the dam. The second pool was above the stream improvement area, and it exhibited many of the features that were prominent in the entire tailwater prior to stream reconstruction. 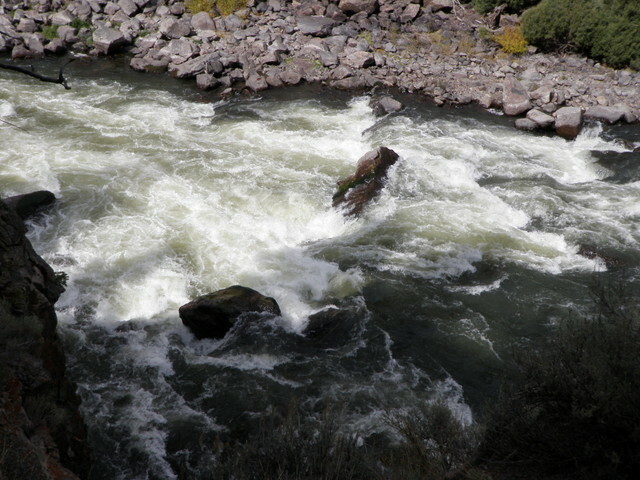 There were numerous large boulders with downstream pockets, and the current split into many areas and did not just run down the center of the river. But I’m getting ahead of myself. In the faster water below the second classic pool, I landed a nine inch brown trout that followed the lead of the rainbow and grabbed the zebra midge just as it started to swing at the tail of the drift. I was quite optimistic as I waded into the tail of the classic pool, but my optimism was misplaced as I covered the entire area with casts and received no response. Steve walked up from below, and his fly was in the hook keep, so we decided to call it quits. It was a pleasant day weather wise with temperatures around 60 degrees when we began on Bear River at 10:30AM, and they probably reached a high in the upper 60’s. I wore a fleece all day and never felt too warm. Landing five fish from the notoriously difficult Yampa tailwater was a pleasant surprise, and I felt rather satisfied as we drove back to Steve’s condo in Steamboat Springs. When Steve originally contacted me with the proposal to spend three days fishing in the vicinity of Steamboat Springs, one place he mentioned was the Bear River. I read a small amount of information about this fishery, so I was quite intrigued to see what it might have to offer. We chose Wednesday as our day to explore Bear River. I read that Yampa means bear in the native tongue, and the Bear River is actually the main headwater for the Yampa River. I’m not sure where the name changes, nor do I know why they used the Native American name at lower elevations and then converted to the English word in the headwaters. 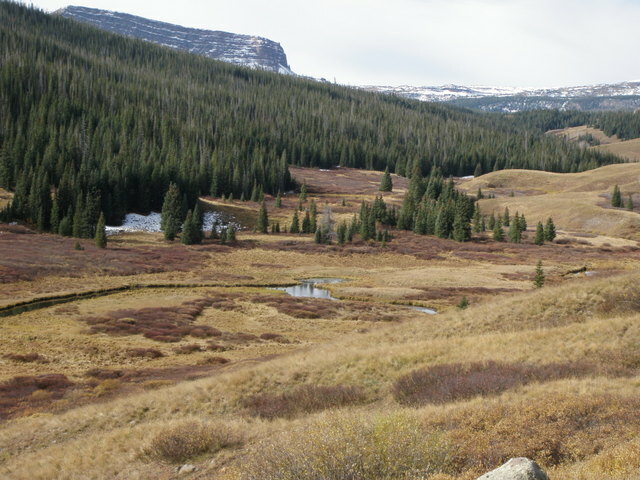 The Bear River begins in the southeastern section of the Flattops Wilderness and flows in a northeasterly direction through the town of Yampa, CO and then continues as the Yampa River until it fills Stagecoach Reservoir and then bends northwest through Steamboat Springs until it merges with the White River. Steve and I departed Steamboat Springs on Wednesday morning and stopped at Steamboat Flyfisher to gather information about the Bear River area, and we asked questions about public vs. private access and of course suggestions on productive stretches to fish. Armed with this info, we were on our way on a roughly 45 minute drive to explore new water southwest of Yampa, CO.
We drove seven miles on a route 7 southwest of Yampa, CO until we reached the national forest boundary. The folks at Steamboat Flyfisher suggested that we could fish anywhere on national forest land. They mentioned three lakes in the area and suggested that the stream between the lakes was also productive, so Steve and I continued along the road until we reached the first stillwater, Yamcolo Reservoir. After Yamcolo there was a short stretch of stream, but it was not very close to the road, so we traveled along the road to Bear Lake. Quite a few rings appeared in the smooth surface of Bear Lake indicating feeding fish, but we were more interested in exploring the moving water, so we continued to the stream above Bear Lake. The stream in this area meandered through a wide meadow, and the water appeared to be quite clear and smooth, but there was a section just above the lake that exhibited a higher gradient with pockets and runs. 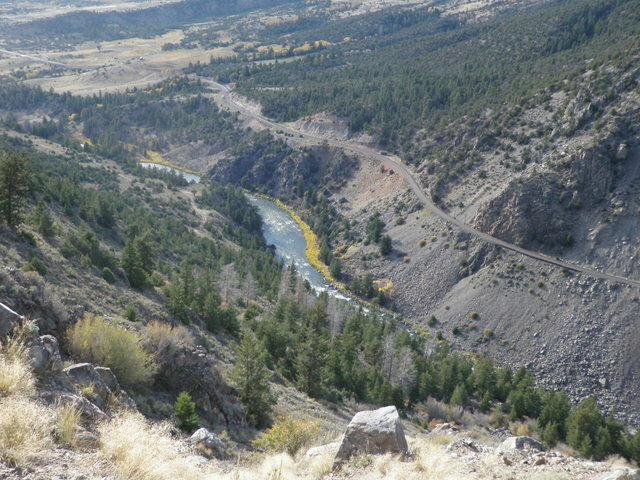 We decided to begin our quest for Bear River trout here and pulled into a pullout on a bluff high above the meadow. I was prepared to fish first, so I carefully negotiated my way down a steep bank, crossed a small tributary stream on the breast of a beaver dam, and then intersected with Bear River. I crossed to a small knoll on the other side and then crashed my way through some bushes until I was quite a distance below the smooth meadow water. Traces of snow remained in the shadow of the hill and the air temperature hovered in the low 50’s as I made my first cast. I chose my Loomis five weight and began fishing with a light olive stimulator. The stream at my starting point was quite narrow and fast and offered few desirable deep pockets to test with my high floating imitation. I worked upstream for ten minutes with no sign of a fish; not even the flash of a disturbed bank hugger. With this disappointing turn of events I removed the stimulator and tied on a Chernobyl ant with a hares ear dropper. Over time I have discovered that if there are fish in a stream, these flies will always provoke at least a refusal. Unfortunately Bear River is apparently an outlier when it comes to this Dave Weller law of flyfishing, because I fished upstream for another twenty minutes until I met Steve, and I had yet to see any evidence of trout in Bear River. I skipped around Steve who was having an equally disappointing experience, and I arrived at the tail of the meandering smooth water that looked like a very long winding beaver pond. I scared one nice fish that was resting near the bank just in front of me, and then I shot a long cast to the middle of the pool approximately thirty feet upstream. The instant the Chernobyl and beadhead hit the water, I saw three or four fish in the 12-14 inch range scatter downstream. There may have been even more that streaked upstream, but I could not see into the water that far ahead. On the one hand I was excited to finally see evidence of nice sized fish in Bear River, but at the same time I was rather intimidated by the clear smooth water and skittish fish. Clearly a dry/dropper was not the proper approach for these conditions, so I clipped the flies off and tied on a size 16 gray deer hair caddis. Steve meanwhile circled around me and moved a comfortable distance upstream, and was seeing the same challenging conditions. I began making long distance casts with the caddis and checked my cast high as though I were casting my fly toward the sky. This allowed my solitary caddis to flutter down softly to the surface, however, I did not take the time to extend my leader or convert to a 6X or 7X tippet. Despite the tantalizing flutter cast, the line and its shadow probably disturbed any trout that might have had an interest in my caddis imitation. I did make one cast within a foot of the high right bank, and as I lifted my fly to recast, I saw a large bulge on the surface behind my fly. I attempted to repeat this movement on subsequent casts, but I was never able to initiate another follow or bulge. Steve and I conferred, and we both concluded that we could spend the entire day in this place and achieve nothing more that frustration, so we climbed back up the hill to the car and drove back downstream below Yamcolo Reservoir. As we moved downstream we stopped several times to inspect the water, but each time it was rushing downhill at a rapid pace, and the small narrow torrent was bordered by backcast-menacing willows. Finally we found a pull through where the stream opened up a bit and lacked tall trees close to the water. We agreed to give this a test, and Steve chose to walk upstream from the parking spot while I hiked down a two lane road until I reached a bridge of sorts. It was a large log that spanned the river and a stiff wire was strung between two posts to use as a handrail. I decided that this would be my beginning point and ducked under some tree limbs to reach the rushing water. I made a few casts with the tiny gray caddis, but it was impossible to see in the frothy water, so I exchanged it for a size 12 royal stimulator. 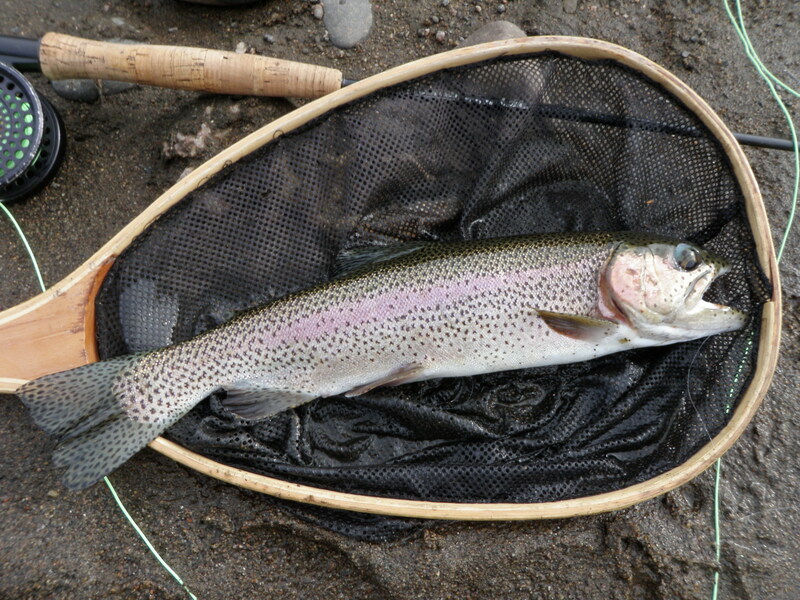 This proved to be a fortuitous move, as I landed two brown trout and a rainbow in the first fifteen minutes. One of the browns and the rainbow were nice chunky twelve inch fish. I was rather euphoric with this sudden turn in my fortunes, but the rapid catch rate would not sustain itself. As I moved upstream and away from the crude bridge, I began to experience refusals to the stimulator, and the stream offered fewer decent fish holding nooks. I replaced the stimulator with a Chernobyl ant and beadhead hares ear in hopes that the denizens of the small river would favor a subsurface morsel of food, but these flies did not perform any miracles. The stream was running high relative to the small streambed, and this restricted the number of pockets and pools and made wading quite difficult. The current was rushing right along the bank, and the thick overhanging brush made it challenging to exit and work around troublesome passing spots. Just before returning to the car, I replaced the Chernobyl with a gray parachute hopper, but this fly did not produce any better than the previous. By 1 o’clock I covered a vast amount of stream real estate, so I climbed up the bank and discovered that I was just above Steve’s car. I visually surveyed the area looking for Steve, as I sensed this was not the type of water that he favors, but I did not see any signs of him so I walked up the road forty yards. Since Steve was not present at his car, I assumed he was still fishing his way upstream. I turned right and cut through a thick stand of evergreen trees until I reached the stream, but I saw no signs of Steve. Oh well I thought, perhaps he found some water to his liking. I decided to resume fishing and replaced the parachute hopper with a Charlie Boy in order to create more visibility from my top fly. In addition I swapped the hares ear nymph for an ultra zug bug. This combination of flies clicked as I landed another eight brown trout before quitting at 2:45PM, but these fish did not arrive in my net without significant effort. The wading continued to be as difficult as it was in the morning, and I covered a lot of water between locations that might yield fish. 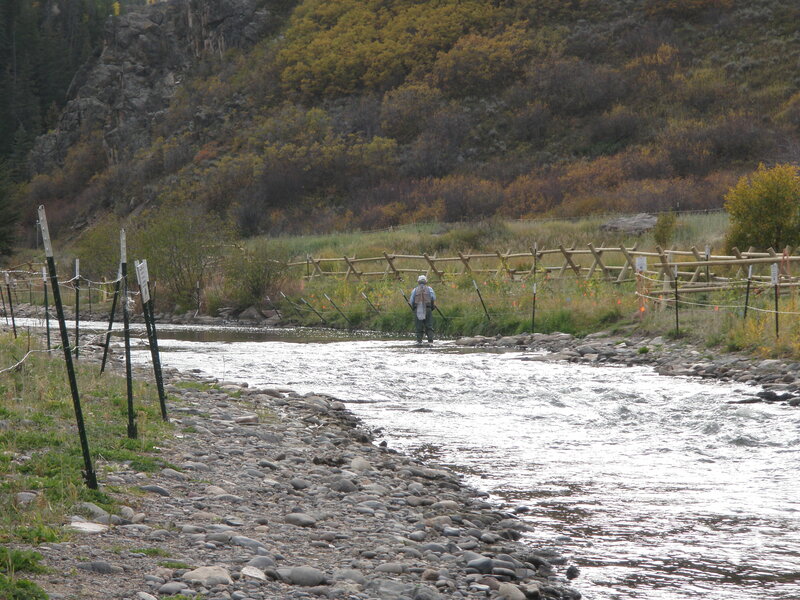 Casting to marginal small pockets was a waste of time as the swift current swept the flies into fast water before a fish could obtain half a look. Toward the end of my time on Bear River the Charlie Boy began to produce, as I landed two or three brown trout in the 12-13 inch range. In fact the last fish of the day proved to be the best as a thirteen inch brown confidently smashed the Charlie Boy hopper. 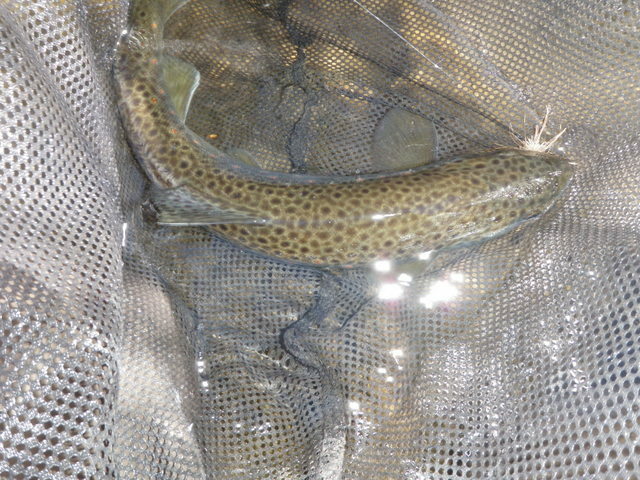 I savored this fish by taking three photographs before gently releasing it into some slow moving water along the bank. 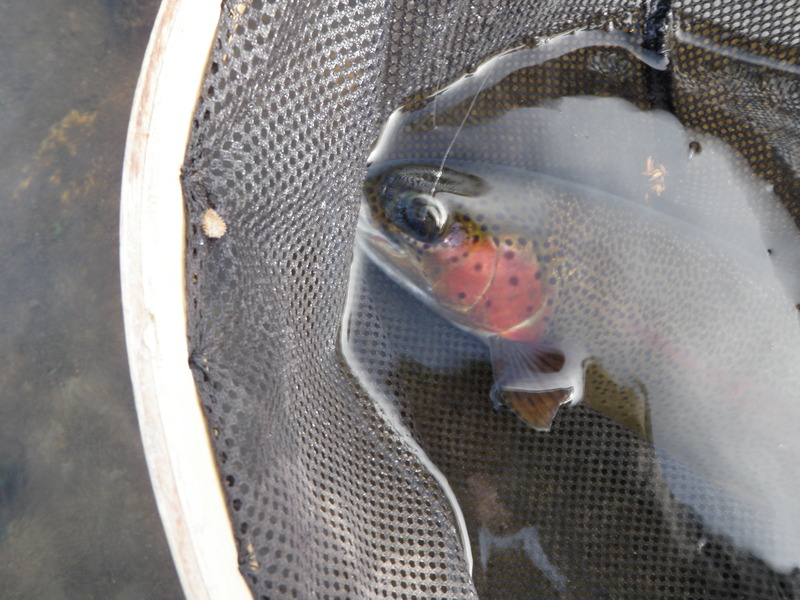 Of the twelve trout I landed on Wednesday from the Bear River, ten were browns and two were rainbows. I returned to the car at 2:45 and discovered Steve perched on a large rock next to the road waiting for me. Apparently he had quit within thirty minutes and went searching for me, but by some stroke of misfortune we must have passed without seeing each other. It was fun to explore the Bear River, but Steve and I agreed that we would only return if the flows were reduced by 25% or more. Every day of fishing is better than a day at work, but not all days are equal. Friday October 3 was one of those fishing days that tested my patience. Jane and I returned from a trip to Pennsylvania where we attended my high school reunion and visited with family members. Since I had not fished in over a week, I was anxious to make a trip while the weather remained relatively comfortable. 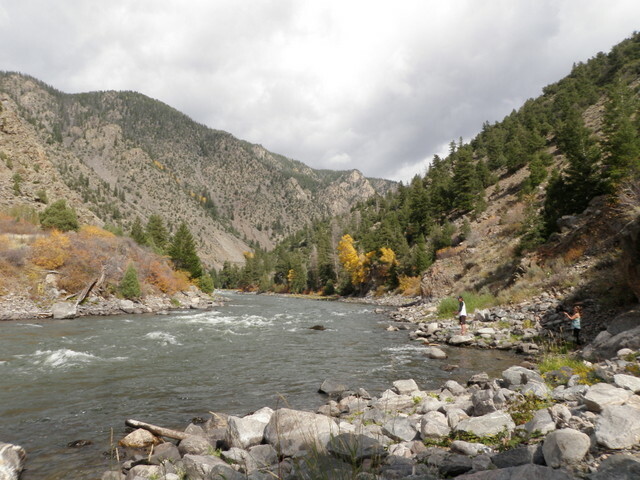 My last trip to the Arkansas River was disappointing due to the rain and muddy water conditions, and I was convinced that a return would yield some very enjoyable fishing. I opened my blog and read my reports on two trips that I took in previous years on October 2, and this served to increase my desire to make the trip on October 3. Unfortunately I began feeling the effects of a developing head cold on Wednesday, but I decided to ignore my body’s desire for rest and make the long drive in spite of a stuffy head and a body sapped of energy. The weather forecast called for highs in the low sixties, and this actually sounded fairly pleasant to me for early October. The piece of information I failed to factor into my planning however was wind, and a constant breeze hindered my fishing the entire time I was on the water. I got off to a reasonably early start, but by the time I reached the pullout at the Fremont – Chafee county line, another car was parked in my spot, and two fishermen were pulling on their waders. I decided to reverse my direction and drove west on route 50 to the next large pullout. The dashboard thermometer registered 39 degrees as I prepared to fish at 10:30AM, so I pulled on my UnderArmour underlayer plus my Adidas insulated pullover and then added my raincoat as a windbreaker. For head gear I chose my New Zealand billed hat with ear flaps, and then I stuffed my lunch in my backpack and rigged my Sage four weight four piece rod. 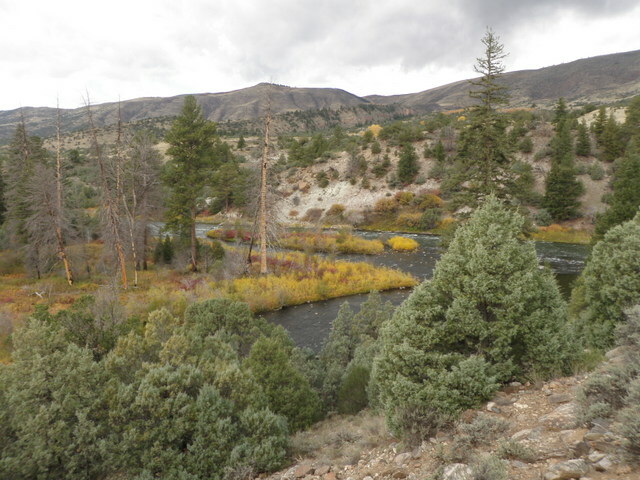 I carefully descended the steep bank next to the highway and crawled through a tunnel that another fisherman had pruned through the willow canopy and found myself on the edge of the river. I remembered a place where I thought I could cross to the opposite bank, but it was forty yards farther upstream, so I began fishing the edge pockets as I moved in that direction. I began with a Chernobyl ant and a beadhead hares ear, and in the first 30 minutes I landed two small trout barely over six inches. The small rainbow slurped the Chernobyl, and a brown trout snagged the hares ear before I reached the place where I planned to cross the river. As I scanned the river at my intended crossing point, I concluded that it was too risky particularly given my low energy levels from fighing the developing head cold. I hooked my fly in the rod guide and climbed up the steep embankment to the highway and returned to the car and then hiked along the shoulder to the county line pullout. Of course the fishermen that diverted me from my orginal plan were no longer present, and I could have driven to my favorite pullout. I thought about returning to the Santa Fe in order to move it closer to the area I hoped to fish, but I decided that the extra walking was good exercise. As is my usual practice, I dropped down to the river and waded across the shallow tail of the long pool and then climbed the north bank to the railroad tracks and walked east until I was above the small island that I favor. Much to my amazement there was another fisherman on the north side of the river twenty yards below the tip of the island. I did not feel it would be courteous to take my normal path and cut in just above him, so I scrambled down to the river above the island and then waded along the southern edge to a point where I could begin fishing the small north channel. I skipped the bottom third of the small braid, but I still had the upper two-thirds remaining to fish, and that is generally the most productive portion of the braid. I was finally in a desirable position, and I began prospecting the north channel with the Chernobyl ant, beadhead hares ear, and ultra zug bug. After overcoming numerous obstacles to reach this water, I expected to be rewarded, but that was not the case. I experienced a couple long distance releases, but failed to land a single fish from my favorite stretch of water on the Arkansas River. From the tip of the island I continued for another fifty yards along the right bank, and once again the fish were uncooperative, so I welcomed a break and found a nice spot to eat my lunch and observe the river. It was now a few minutes after noon, and all I had to show for my efforts were the two trout barely over six inches. After lunch the sun was high in the sky and quite bright, and I was too warm with my multiple layers, so I removed my Adidas pullover and wrapped it around my waist and rolled up the raincoat and stuffed it in my backpack. In a final concession to the warmer air temperatures I folded my earflaps up under my hat. In addition to changing my clothing, I also elected to swap the Chernobyl ant for a tan Charlie Boy hopper since the Chernobyl was generating occasional refusals. As I made this exchange, I moved the ultra zug bug to the second fly position and replaced the hares ear with a soft hackle emerger on the point. I was refocused with a new positive attitude as I resumed my upstream migration through some very attractive deep pockets that generally are quite productive. Well I suppose everything is relative. The nice pocket water yielded a ten inch brown and another smaller fish, so that was better than my morning results, but it did not compare favorably with my history in this area. I was now across from the county line pullout at the bottom of the long slow moving pool that I typically skip, but I decided to cast along the edge while I moved quickly and covered a lot of water. I was targeting fish that were holding tight to the bank that might jump at the opportunity of a quick grasshopper meal. The wind continued to blow constantly with intermittent strong gusts, so surely some late season hoppers were getting blasted into the river. In the deep slow water at the lower end of the pool next to a large protruding rock a nice fourteen inch brown trout smashed the Charlie Boy hopper, and I successfully battled it to my net. Since this fish far exceeded the size of my previous catches, I decided to take a photo; but when I reached inside my wader bib where I usually keep my camera in its waterproof case, I discovered that it was missing. I quickly released the wild brown and remembered that I removed my camera and case in the process of removing layers of clothing at lunch, so I hustled back along the rocky shoreline and fortunately recovered my camera at the lunch spot. Instead of returning along the river, I scaled the steep bank to the railroad tracks and returned to the point of my missing camera revelation where I resumed prospecting the edge of the pool. During this early afternoon time frame a severe headwind kicked up and hampered my casting, however, I managed to land another decent brown on the trailing soft hackle emerger. I was actually pleasantly surprised that the slow deep water was producing better than the normally preferred deep pockets and runs. Next I approached a very attractive spot where some nervous water fanned out from a deep pocket. It was one of those places that screamed large trout, so I cast the Chernobyl so it plopped at the very tail of the fan area, and the nymphs dropped into the deeper water below the swirly surface. Immediately I saw a large rainbow emerge from the riffled water as it grabbed something. I surmised it was one of my trailing flies, so I reacted with a solid hook set and battled a sixteen inch rainbow to my net. This would be my best fish of the day, and it was an exciting visual experience. As I attempted to photograph my prize catch, the rainbow resisted all attempts to be calmed and in the process splashed my camera lens with water. I snapped a couple photos anyway, so I would have something to remember and then carefully released my valiant foe to return to the depths of the river. Once again I moved on and landed two more much appreciated medium sized browns in riffle areas. Both fish snatched the soft hackle emerger as it drifted back toward me in water of moderate depth, but I covered many other sections of similar water without similar results. By late afternoon the sun glare frustrated my efforts to follow the surface fly, the temperature dropped, and wind continued its relentless assault on my patience, so I decided to call it quits at 3:45 and hiked back to the crossing point. I climbed the bank once again to the highway and then paid my dues for not moving the car by hiking along the shoulder for another .2 miles. The last hour of fishing was nonproductive and a late afternoon hatch did not seem imminent. Given my developing cold, my lack of energy, the vexing wind and the lack of a hatch, I was quite happy to land nine fish including three fish in the fourteen to sixteen inch range. The casual sip of my nymph by the large rainbow was certainly a highlight of the day and perhaps one of the better moments of 2014. The season is quickly dwindling, but hopefully I will have a few more opportunities to enjoy autumn fly fishing before the weather drives me to the fly tying bench. 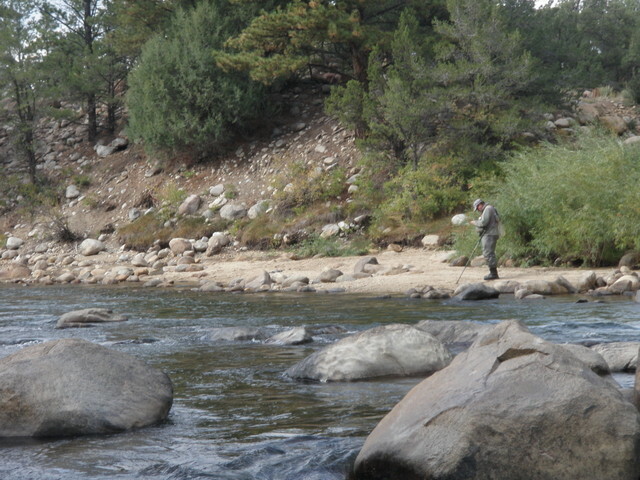 Sunday September 21 was probably my last opportunity to fish in September, so I made plans to visit the Arkansas River. The weather report concerned me with a high probability of rain, but overcast skies and light rain generally portend blue winged olive hatches and good fishing, so I decided to follow through with my plan. I mentioned my planned fishing trip to Todd Grubin on Friday, and he agreed to join me. I described the location of the Fremont- Chafee border to Todd, and we agreed to meet there at around 10AM. I departed Stapleton by 6:40, and the sky was quite overcast and foggy for much of the trip. Unfortunately when I turned left off of 285 on to CO 291, the drizzle changed to rain, and as I crossed the river at the bridge just before Salida, I was disappointed to see a red mud color. Normally I would have turned around at this point, but Todd was meeting me at the county line, so I proceeded downstream. I executed a U-turn and pulled next to Todd along route 50, and we agreed that fishing in the Arkansas River below Salida was not going to happen. We agreed to continue on route 50 to the ArkAnglers fly shop to inquire about alternative fishing options. It continued to rain steadily as we pulled up to the shop. The salesperson inside told us that the mud was originating in Browns Canyon, and our safest contingency plan would be to fish in an area north of Buena Vista that is referred to as the tunnels. We left with the intention of following ArkAngler’s recommendation, however, as I crossed the Arkansas River at the Stone Bridge access, the river did not look off colored. This surprise caused me to turn left and drive to he Smythe Lease. The dirt road converted into mud, and Todd and I carefully negotiated the slippery surface to the entrance to the lease. The lease sign was gone, and the gate was open, and excavation equipment was parked near the entrance. Since there was no sign indicating private or no trespassing, we agreed to drive to the parking area. The steady rain changed the recently graded road to mud, and I grew quite concerned that one of us would get stuck and require a tow. Just before the parking area we needed to cross a newly carved lane that ran perpendicular to the road we were on, and there was a drainage ditch between us and the parking lot. I gunned the engine and slid across with a bit of fishtailing and breathed a sigh of relief when I made it. We prepared to fish while the rain continued to descend in steady sheets, and then we walked down the path to the river. We discovered a very new stair step structure over the fence, so we concluded that the area was still open to the public. Unfortunately when we reached the river, we discovered the water was a deep brown color, rather than the red hue we had seen below Salida When I glanced down at the river while crossing the bridge, I failed to notice the murky color because I was expecting to see red mud Todd tied on a San Juan worm, and I knotted on a black leech, and we fished for ten minutes with no action. Todd and I concluded that it was futile and decided to move on to the tunnels where the water was at least clear. We both agreed it was foolish to continue flailing in dirty water when clear water beckoned farther upstream Crossing the ditch on the gradual uphill was even scarier than on the way in, and I was thankful for the AWD which activated for 20 seconds as I spun through the treacherous mud. As we drove north on route 285 the rain slowed, but the sky remained overcast with dense gray clouds everywhere. Finally at 10:45 we reached the tunnels area, and as one would expect, there were a series of short tunnels cut in the rocky hills that ran up to the edge of the river. We parked beyond the last opening and descended a steep path that crossed the railroad tracks before reaching the river. As the sky remained quite gray, and the sun was nowhere in sight, I chose not to apply sun screen. Finally after leaving the house at 6:40AM, I was ready to begin fishing at 11:00AM. Both Todd and I elected to begin fishing with strike indicator nymph rigs since that is what remained on our lines from the brief visit to the Smythe Lease. The water in the tunnels area was crystal clear and deceptively deep as a result of the narrow streambed, and this thwarted my efforts to cross to the opposite bank. Consequently Todd and I alternated positions on the eastern side over the first hour. I beganwith a 20 incher and a beadhead hares ear, but these flies yielded no results. After a bit I exchanged the hares ear for a RS2, but this likewise failed to produce, so I abandoned the nymphing approach and switched to a dry/dropper with a tan Charlie Boy hopper, beadhead hares ear, and the RS2. As these flies swept by the front of a large exposed boulder, I felt some weight and set the hook, and a fish shot diagonally upstream. I gave the fish line at a rapid rate, but my efforts were to no avail as the streaking missile snapped off the hares ear and RS2. 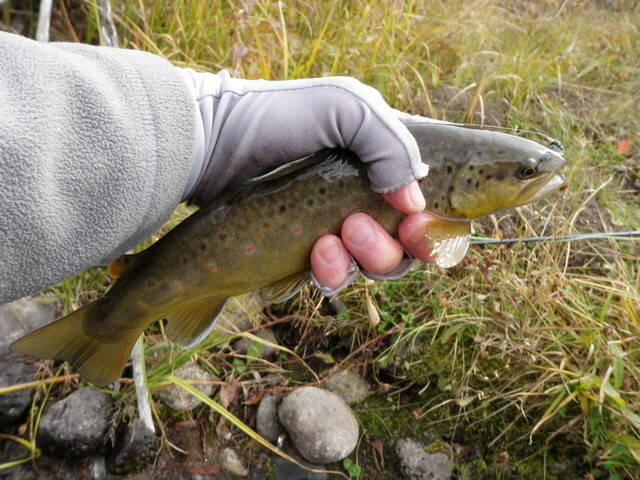 I replaced the lost flies with matching imitations from my fleece pouch and resumed fishing and quickly landed a small brown trout to register the first landed fish of the day. I now moved upstream along the bank and popped casts to the pockets and riffles of moderate depth where the dry/dropper approach is typically effective. I continued to alternate stretches with Todd, and at 12:30 we arrived at a long deep pool. I was about to skip around the pool since this type of water is not very conducive to the dry/dropper method, but we began to see rises near the tail. It was also around this time that the sun broke through the clouds, and Todd loaned me his sunscreen. Brief periods of sunshine began to appear among the predominant dense cloud cover. While Todd and I stood at the tail of the pool observing the frequent rises, I spotted a pair of blue winged olives, and with this information, Todd jumped in and began casting to rising fish. I meanwhile moved to the midsection still intending to skip by the pool and fish the soft hackle emerger in the faster water at the head of the pool and above. As I moved along, however, I observed an increasing number of emerging mayflies and rising fish. I couldn’t resist the challenge, so I snipped off the dry/dropper flies and tied on a size 20 CDC olive. A strong breeze was blowing up the river, and this played havoc with my attempted downstream and across presentations, as the wind repeatedly straightened my leader and removed all the slack. In addition I experienced difficulty picking up where my fly landed because of the repositioning caused by the breeze. I persisted in this frustrating manner of fishing for 30 minutes with a refusal or two as my only reward, while Todd meanwhile landed a pair of fish on his size 18 parachute Adams with an olive body. In addition Todd also experienced numerous refusals, or “swats”, as he refers to them. During a pause in the hatch I decided to eat my lunch on a large high rock above the pool, but before doing so I planned to take a photo of Todd. At this point I discovered that I left the camera in the car, so I walked back to the Santa Fe and retrieved the camera, disposed of some trash, and removed my raincoat and pulled on sungloves. 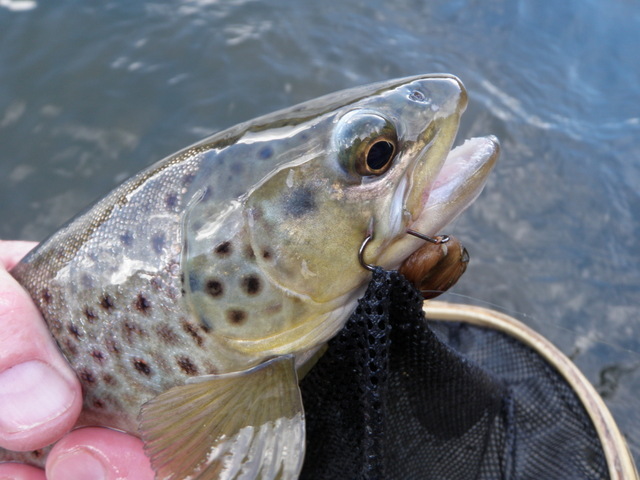 When I returned to the pool, the hatch resumed, but I resolved to save myself frustration and moved to the top of the pool and returned to the Charlie Boy, hares ear, and soft hackle emerger. I managed to land a few more small brown trout on the hares ear, but the soft hackle emerger was not adding value and the hatch ended, so I substituted a beadhead pheasant tail. I finally reached a wide shallow point where I was certain I could safely cross, and I successfully did so. Now Todd and I could work up the river in parallel. The Charlie Boy began to inspire rejections from curious fish so I once again made a change to my array of offerings and tied on a Chernobyl ant in place of the hopper. I also suspected that my leader was too short for the deceptively deep pockets and plunge pools in this rocky area, so I extended my tippet an additional 18 inches. With these changes I finally fell into a nice rhythm on the west bank, and my catch frequency surged, although the fish were predominantly 9-11 inch brown trout. I am convinced that the deeper drift created by extending my leader was a major contributing factor to the higher catch rate. One of the fish succumbed to the pheasant tail, but more snatched the hares ear, so I once again reconfigured by moving the hares ear to the point position and then tried the ultra zug bug as the middle fly. This combination of flies really clicked, and I rapidly moved my fish count to 17. Interestingly the ultra zug bug began to outperform the hares ear as the afternoon progressed. The most productive areas on the river were wide riffles of moderate depth and the cushion in front of large boulders when accompanied by a lift or sweep. Also prime areas were narrow deep slots between large rocks and faster currents. 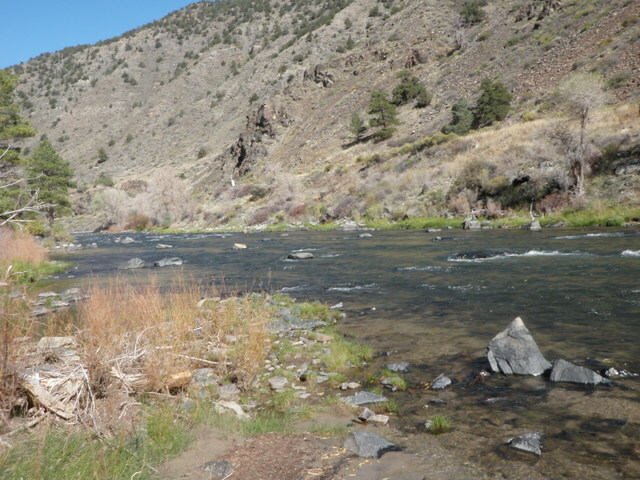 Sunday was not the day I expected in my favorite water east of Salida, but the water was clear and the weather evolved into a cool pleasant afternoon, and I managed to land 17 small trout. My best fish was a 12 inch rainbow, and I added three eleven inch browns. Todd did not sample the best that the Arkansas River has to offer, but hopefully I can convince him to return another time under more favorable conditions.